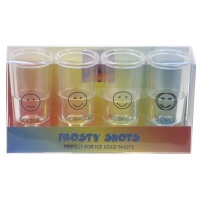 These Frosty Shot glasses are just great for drinking ice cold shots. They are made from double-walled acrylic, pre-filled with sterilsed water. Simply place them upside down in the freezer and wait until they are frozen. Then, take them out, fill with your chosen spirit or shot and drink away! Great with our Alcoshot kits!